Here is a photo of a dog I met yesterday during my hike. First I thought the dog would be lonely, but the dog owners were just 30 meters away and followed up. The dog seemed to know the path, and enjoyed to show the owners the way. Also it was funny to see how the dog did carry the stick on his path. You can get some interesting photos with a 300mm lens, because you have enough distance to take photos in all kind of situations without interfering too much. I still like to take photos with my other lens, but I do now really love to take photos with my longer lens. Nice portrait of the dog Dennis. 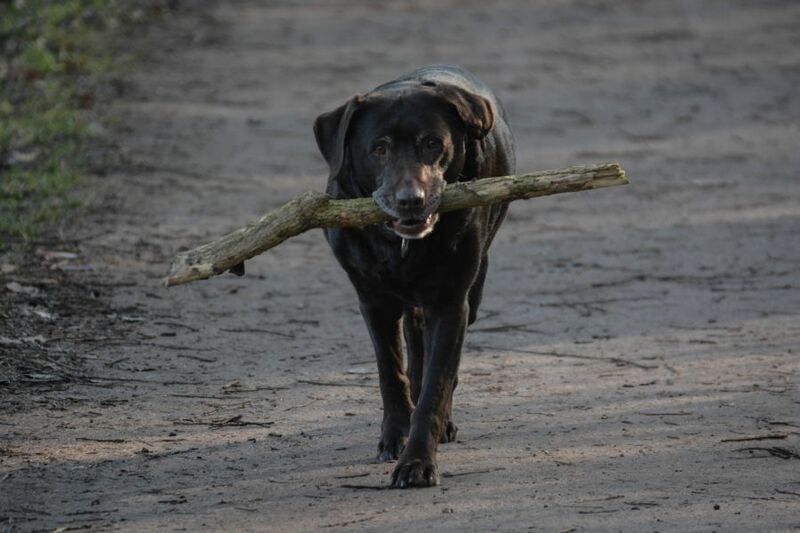 It is funny how some dogs love to carry things. I guess that labradors do it a lot because they are retrievers so it is in their nature. My Cindy who is half labrador will often pick up and carry a toy around the house esepcially when she is excited. He looks like a nice older dog. Outside it was just one of those snapshots for me where I didn’t think a lot about the scene, but when I saw the photo at home on the screen, I immediately liked the photo too. I do think too it’s in their nature, but I also saw some other dogs carrying things… near the pond there are some big wood sticks, and I often see dog owners throw sticks… so, I assume the dogs like it so much that they carry the stick until the dog owner will take it back and throw it again 🙂 Anyway, we had labradors and half labradors in the family and in the friend circle too, and I agree, it’s definitely in their nature to carry stuff. Beautiful dog portrait! With its gray face, it reminds me a lot of our previous dog in her elder years.